Satoshi Ohno (大野 智 Ōno Satoshi) (born November 26, 1980) is a Japanese idol, singer, actor, artist and radio host. He is the lead vocalist and leader of Japanese boy band Arashi, hence his nickname Leader (リーダー Riidaa). Born in Mitaka, Tokyo, Ohno began his career in the entertainment industry when he joined the Japanese talent agency Johnny & Associates in 1994 at the age of 13. Ohno started an acting career in 1997 when he was cast to be part of the stage play Kyo to Kyo. In 2008, almost nine years since his debut as a singer with Arashi in 1999, Ohno became the first and the only artist from Johnny’s to hold and opened his own an art exhibit titled “Freestyle” and received his first starring role in a drama, for which he earned a handful of Best Actor awards. Ohno was born in Mitaka, Tokyo as the youngest child of his family. He has one older sister. During middle school, his mother sent in his application to Johnny & Associates without his knowledge. An invitation to audition was sent back to Ohno, and he subsequently became a trainee in October 1994. In order to focus on the stage play Kyo to Kyo, which ran from 1997 to 1998 during his trainee days, he withdrew from high school and moved to Kyoto. Before his music debut with Arashi, Ohno wanted to resign from Johnny & Associates. However, then-president Johnny Kitagawa asked him to help out with a song recording and to pack up for a trip to Hawaii, which turned out to be the place where the press conference announcing the formation of Arashi was held. With Ohno at the age of 18 at the time, Arashi was officially formed on September 15, 1999 and made their CD debut on November 3, 1999. Since much of his trainee days was spent in Kyoto, he was the least known member during Arashi’s early days. Ohno is the lead vocalist of Arashi. Although his music career is primarily with Arashi, he had solo concert called 3104 (which can be read as his name Satoshi in Japanese) in 2006 and became the first member in Arashi to release a solo single in 2009. He has also choreographed a few dances for Arashi’s concerts, such as the dance for the song “Carnival Night Part 2”. 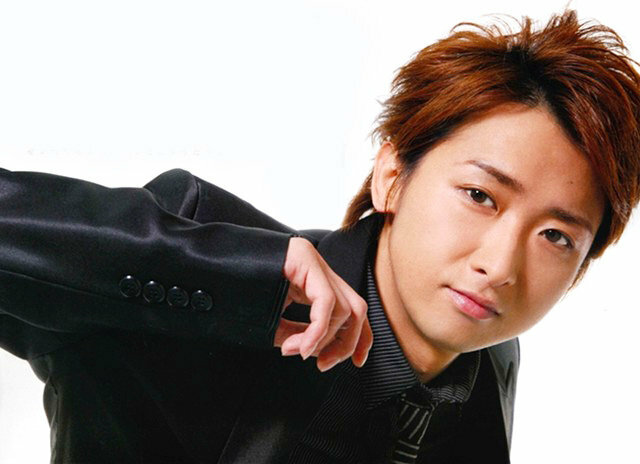 Ohno provided the vocals to the insert song “Yukai Tsukai Kaibutsu-kun”, which will be released on July 7, 2010 as a single, for the drama Kaibutsu-kun. In 1997, Ohno was a cast member of Kyo to Kyo with Musical Academy (MA) leader Shingo Machida (町田 慎吾 Machida Shingo) and continued to act in other stage productions such as Koichi Dōmoto’s Mask and Shōnentai’s Playzone after Kyo to Kyo was over. Since then, he has done a number of stage plays such as the Pū (プーシリーズ Wind) series, West Side Story with bandmates Sho Sakurai and Jun Matsumoto, and Amatsukaze (アマツカゼ). In 2006, Ohno starred in Tensei Kunpū, another play that was part of the Pū series. He portrayed Kaoru Kazamine (風峰 薫 Kazamine Kaoru? ), a man who was accidentally sent back to the Edo period of Japan through a system malfunction. In 1999, Ohno made his drama debut in the volleyball-centered short drama V no Arashi (Vの嵐), which was Arashi’s first drama together. Although Ohno has appeared in the fewest dramas out of all the members, Ohno was given his first starring role in the 2008 suspense drama Maō. He co-starred with Johnny’s Jr. member Toma Ikuta and portrayed a two-faced lawyer who sought for revenge against the person who murdered his brother years ago. Soon after in 2009, he was given another starring role in his first comedy drama Uta no Oniisan (歌のおにいさん Brother of Songs?). With Kanjani Eight member Ryuhei Maruyama as his co-star, Ohno played a musician who unexpectedly becomes “Uta no Oniisan” for a children’s program after being dumped by his girlfriend, kicked out of his band and labeled useless by his family. On September 4, 2009, it was announced that a select number of different artists from Johnny’s would take turns participating in a television mini-drama project on Fuji Television from October 23, 2009 to April 2010. Entitled 0 Gōshitsu no Kyaku (0号室の客 Guest in Room 0), Ohno starred in the first story called “Akogare no Otoko” (憧れの男 Yearning Man), which ran for four episodes in total. The first story was about a salaryman and a club hostess visiting a strange “Room 0” that can reveal anyone’s “grade” as a human being. In January 2010, Ohno co-starred with the other members of Arashi in the human suspense drama special Saigo no Yakusoku (最後の約束 Last Promise). Ohno portrayed Satoru Mashiko (益子 悟 Mashiko Satoru), a 28-year-old employee of a cleaning company who is caught up in a building hijack. On February 11, 2010, it was announced that Ohno is set to star in the live-action adaptation of the manga and anime Kaibutsu-kun, which began airing on NTV from April at 9:00 pm (JST) on Saturdays. Ohno made a guest appearance on the last episode of bandmate Sakurai’s drama Tokujo Kabachi!! (特上カバチ!! lit. Extraordinary Quibbling) playing a corrupted lawyer. He will also reprise his role of Kaibutsu-kun for the Kaibutsu-kun special set to air on June 26, 2010. In 2002, Ohno made his motion picture debut in Arashi’s first movie together, Pikanchi Life Is Hard Dakedo Happy (ピカ☆ンチ Life is HardだけどHappy Pikanchi Life is Hard But Happy?). He portrayed Haru, a bizarre high school student who gets swindled during his trip to Harajuku. Two years later in 2004, Ohno reprised his role for the sequel Pikanchi Life Is Hard Dakara Happy (ピカ☆☆ンチ Life is HardだからHappy Pikanchi Life is Hard Therefore Happy?). In 2007, the group came together once again to act in their third movie together, Kiiroi Namida (黄色い涙 Yellow Tears), with Ohno acting as an oil painter. Ohno has his own radio show called Arashi Discovery, which is currently airing every weekday from Monday to Friday on FM Yokohama since October 1, 2002. When Ohno was in the third grade, he was inspired by his classmate’s Dragon Ball illustration to start drawing. Since then, he has been drawing his own artwork and making original figurines. In 2008, he held an art exhibition called Freestyle, making him the first artist in Johnny’s to hold one. For releases as a member of Arashi, please see Arashi discography. ^ The song was released as a double A-side single with Arashi’s “Believe” song and under the name Yano Kenta starring Satoshi Ohno.